The early evening sun painted the buildings golden and the Wabbits went out on the roof. 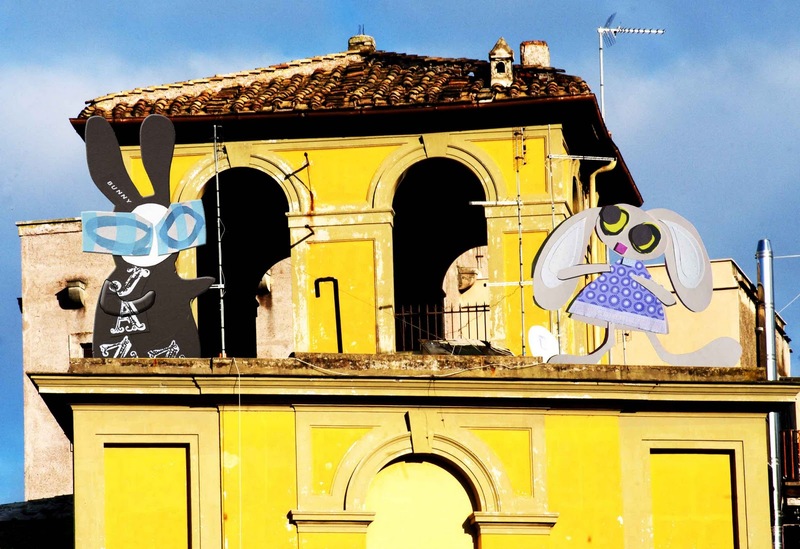 "We usually sing on the roof," said the Wabbit. "Well what's the song this time?" asked Lapinette, "it's your turn to choose." The Wabbit thought and thought. "I don't know any more rooftop songs," he said finally, "but I do know one with a rooftop in it." Lapinette hopped up and down. "Take it away, Wabbit" she cried. The Wabbit turned to Lapinette and started to croon. "Cool town, evening in the city. I'm dressed so fine and looking so pretty!" "You are, your are," sighed Lapinette. "Cool cat lookin' for a kitty, Gonna look in every corner of the city!" sang the Wabbit, "till I'm wheezing like a bus stop!" Lapinette laughed and laughed as the Wabbit pretended to puff and pant. "Running up the stairs gonna meet ya on the roof top," rhymed the Wabbit. "You did you did!" yelled Lapinette. "Despite the heat it will be alright, and babe, don't you know it's a pity," crooned the Wabbit. "What's the pity?" chanted Lapinette. "That the days can't be like the night, in the summer in the city, in the summer in the city," sang the Wabbit. "Oh Wabbit, it's such a pity it’s not the summer," said Lapinette. "We're still hot," said the Wabbit.